"The Best A Man Can Be". Toxic masculinity is weird. It’s an odd constructed concoction involving brute displays of selfishness, an ownership of women, and something to do with size and strength that, in the end, harms anyone who gets in its way. Shaving has for the longest time been seen as a, however flawed, entrance into the mysteries of masculinity for many boys, and Gillette has always welcomes into the fold with a razor and its infamous catchphrase, “The Best A Man Can Get”. Now, toxic masculinity, that brand of masculinity involving abuse, cruelty and control, is brought into a stark spotlight in their Super Bowl ad, premiering today online, “The Best A Man Can Be”. The ad shows toxic patterns of male behavior, inter-spliced with footage of news reports and congressional hearings from the #MeToo movement. We get Terry Crews testifying before congress, CNN reporting on the beginnings of the movement, cut together with children getting bullied, CEOs grabbing their female co-workers while talking over them, as a line of dads manning grills repeat “boys will be boys” as those same boys absorb an infinite amount of toxic influences from garbage sitcoms to garbage behavior from their father. 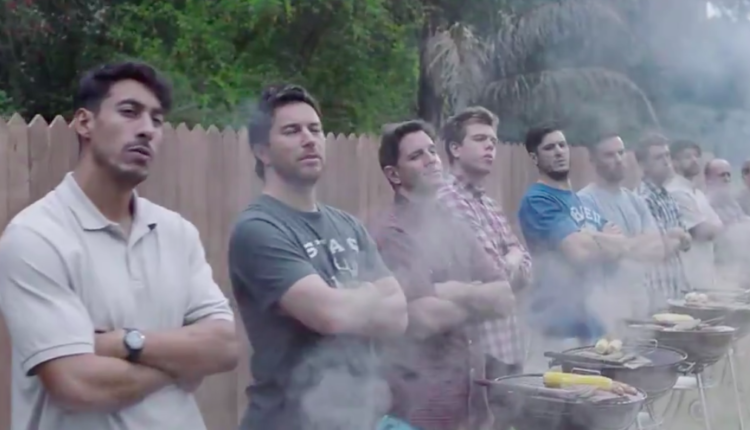 Slowly Gilette asks– is this the best a man can get? Well, the answer is… that’s not the right question! The right question is more, what is the best a man can be? And the commercial shows us the answer to that is… being respectful! Being kind to the women in our lives! Giving a good example to our children and making sure we raise them right without believing that control and violence are the things a man should strive for. Now thus far, the ad has garnered criticism from both predictable and unpredictable locales. The predictable being the deeply toxic, Kavanaugh supporting, desperately toxic trashy men who get mad whenever pop culture is diverse (see, all the blatantly terrible anti-Star Wars fans who made being on Instagram for Kelly Marie Tran such a slog), and those who see the ad and wonder at just how progressive it is to put a message like this into the ad for what is essentially, a product meant to make money. I think that last bit is beside the point, though. There’s something about passive consumerist culture that helps define the rest of culture. What a passive comedian such as Leno or Fallon thinks is the mainstream point of view is what he’ll reinforce. It’s how Trump became popular (SNL thought he would get ratings, fascism be damned), but it can be how we get out of the hole. If reinforcing progressive gender politics is how Gilette wants to sell razors, far be it from me to stand in their way! What do you think of the ad though? Make sure to give us your very reasonable, not at all spittle covered feedback in the comments or on Twitter at @WhatsTrending.